Das ist gut. 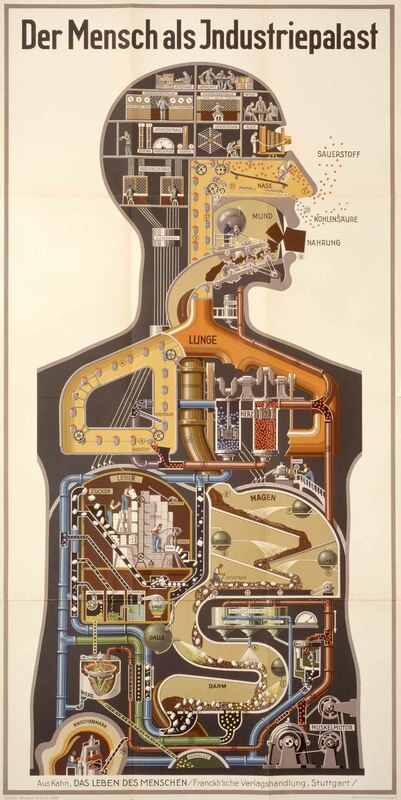 In this video from an interactive art installation, Henning M. Lederer animates Fritz Kahn’s 1927 poster “Der Mensch als Industriepalast” (Man as an Industrial Palace). Kahn, a former gynecologist, ran with the man-as-machine analogy like nobody else. That analogy has some problems, of course, but it makes a good foundation for beginners learning about human anatomy (you know, for kids). Learn more about Kahn here and more about Lederer’s piece here. Major Goodwill score: on a recent trip, Jon Ryan found a clever 1985 pop-up book explaining how a personal computer works. I’m hereby challenging the pop-up tycoons out there to publish an updated laptop version. The binary decoders look especially cool. If your local Goodwill is fresh out, you can order your own copy from Amazon . Illustrator Scott Campbell’s cutaways aren’t exactly real explanations, but they appeal to the same part of the brain. This is also the brain section responsible for drawing elaborate space bases, I believe. Campbell’s “Home Slice” show is on display through March 23rd at the Nucleus Gallery in Alhambra, California. Several great ones are still for sale on the Nucleus site. Plenty more awesomeness on his blog. If you’re so inclined (and own Adobe Illustrator), VECTORTUTS will show you how to make professional-grade exploded isometric technical illustrations* to explain whatever machine you like. *These are the types of diagrams used in patents and other technical illustrations. Isometric, in this case, means a representation of a three-dimensional object in which lines that are parallel in the three-dimensional world are represented as parallel lines in a two-dimensional drawing. In other words, the style ignores the law of perspective that says parallel lines will appear to converge at the horizon line (as seen in Q-Bert and the Sims). Exploded means the individual pieces of an object are separated, so you can see how they all fit together (as seen in product assembly manuals). Made-up things need cutaways too. Jake McKee over at Community Guy recently posted a link to CarType’s collection of wonderful car cutaways. I love these things, especially when they come with call-outs that give you some hope of actually figuring out what’s going on under the hood. Of all my worldly possessions, my car is the thing most in need of explaining. Like just about everybody, I don’t own anything else nearly as complicated, and don’t put nearly as much trust in any other machine. Every day, I count on all these intricate pieces banding together and keeping me alive as I zip along at ridiculous speeds. This is something that deserves to be fully understood. Quick shoutout to RSG for pointing to United Technologies’ use of exploded view animated diagrams to explain the Sikorsky S-92 Helicopter, PW600 Jet Engine, and other neat things. Very cool. United sort of ran out of steam when they applied exploded view to their Employee Scholars program — it’s just an un-technical drawing of a guy’s head with various objects in it that expand and grow labels/explanation when you roll over them. Kind of a let-down after all that awesome. Also, I wish they’d included some sort of permalink system inside the animation, because then I could be pointing you to the coolest parts of it. And now, a musical interlude. This video from Norwegian band Röyksopp doesn’t exactly explain anything, but it uses the tools of good explanation to thrilling effect. And it illustrates nicely how much data, complexity and remarkable thinking flows through daily life. The artistry is clearly awesome, but the delicious topping for me is that they bothered to make so much of this stuff accurate (or at least accuratish). For example, the escalator cutaway is highly detailed and right on the money, and it’s only onscreen for four seconds. There’s a good bit of playful exaggeration too — the parts of the ear are drawn correctly, but sound waves trigger a bouncier cartoon chain reaction than you would actually see.I’ve had a hand in building animated cutaway diagrams before — the type of thing that makes up only a few frames in this video — and fitting the details together is no small chore. Kudos to those responsible, the French production company H5, according to Wikipedia and others. (My kudos are way late, apparently. The video already won best video at the MTV Europe Music Awards, way back in 2002). I found a bit of interesting chatter in the YouTube comments on the video. Several posters took it for granted that this was a depressing view of mundane modern life. I really don’t see it that way. Normally, I do get discouraged by musical montages of workers filing into offices or even families chaotically taking off in the morning (a staple of supposedly cheery breakfast treat ads). The notion that life is hectically repetitive for no discernible reason makes me queasy. But this video was actually uplifting to me. For one thing, I love to be reminded that there is so much to learn about even incredibly ordinary stuff. After all, there aren’t really many boring things, just boring people. It’s good to turn on the awestruck wonder whenever you can. Also, I’m comforted by the idea that even though there’s a lot of complexity under the surface of everything, I could actually figure out what was going on if I took the time to sort through the detailed, readily available information. It’s the same comfort I get walking through the library or bookstore. I may not want to learn all about building construction at a particular moment, but it’s good to know I could pick up several books on the subject (and understand them) if I were so inclined. Nice to have signs that the roads are open. PS: I intended this post to be pure praise, since 100% of our posts to date have had a bit of finger wagging in them, but I can’t ignore the bad splainin’ on both Röyksopp and H5’s Web sites. Which details did you need? Shoe size? Favorite Pop Tart flavor? Very strange to have such dead-end home pages in this day and age.